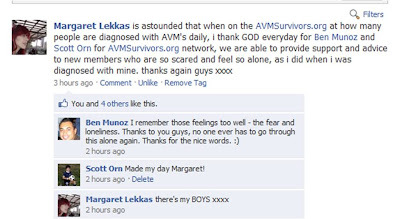 Ben and I got a nice thank you from Margaret, a member of AVMSurvivors.org. Ben started the site a couple years ago and I've been helping him build it. I can't believe we're hitting the 1,200 member mark. These messages are so inspirational. Thanks Margaret!